This news item was posted in Cancer, L, Liver category and has 0 Comments so far. Liver cancer (hepatocellular carcinoma) is the cancer of the liver, also known as hepatoma or primary liver cancer.The liver is composed of a variety of cells such as blood vessels, bile ducts and fat-storing cells. Liver cells or hepatocytes construct the 80 per cent of liver tissues and hence the most of the primary liver cancer emerges from liver cells and is named carcinoma or hepatocellular cancer. Whenever physicians speak off liver cancer they are actually referring to a cancer that has spread form other organs such as lung, breast, stomach, pancreas or colon to the liver. Such liver cancer is termed as secondary liver cancer or meta-static liver disease. It is now clear that the term liver cancer will either refer to hepatocellular cancer or to metaststic liver cancer. It is the fifth most common cancer around the globe. In a single year a deadly liver cancer can kill all those people who are suffering from it. The World Health Organization estimated in 1990 that about 430000 new cases of liver cancer around the world where same number of people were dieing off the disease. In Southeast Asia, Japan, Korea, Taiwan, Hong Kong and China, three quarters of liver cancers are found. It is also frequently diagnosed among the people of sub-Saharan Africa (South Africa and Mozambique). The role virus of hepatitis B plays in leading to liver cancer is an open secret. The frequency of liver cancer is directly related to the frequency of chronic hepatitis B. Those people or patients of hepatitis B who are at more risk of getting liver cancer are men who have hepatitis B virus cirrhosis and a family history of liver cancer. It is also well established that hepatitis C virus can cause liver cancer. According to a survey, 75 per cent cases of liver cancer in Japan are found to be the patients of hepatitis C. older age, male gender, cirrhosis (scarring of liver), alcohol, increased baseline alpha-fetoprotein and co-infection of HBV are the factors that aggregate the possibility of liver cancer. One of the most common things that are associated with the liver cancer is the cirrhosis caused by chronic alcohol. It is pertinent to remember that all those people who are strongly used to take alcohol are more likely to die of non-cancerous diseases due to increased complications. The most dangerous chemical that leads to liver cancer is aflatoxin B1, a product of mold called Aspergillus flavus found in food preserved in humid or hot environment. Peanuts, corn, rice, wheat and soybean are the foods in which this chemical is mostly found. There is no medicine that is a cause of liver cancer but if changes occur in the hormones of females and protein constructing steroids that help in building heptic adenomas. 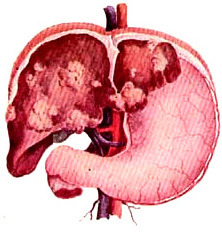 The benign tumors of liver have the tendency to transform into malignant or cancerous. In many cases the hepatic adenoma results in cancer. Heredity hemochromatosis results in liver cancer in about 30 per cent of the patients. Greater risk is for those people who get cirrhosis with hemochromatosis. All those people who have cirrhosis are at greater risk of having liver cancer, whether the cirrhosis is of any kind. Alpha 1 anti-trypsin deficiency along with all those conditions mentioned above (hepatitis C, hepatitis B, hemochromatosis and alcohol) leads to cirrhosis. There are contradictions in the initial symptoms of the liver cancer. In countries where liver cancer is frequently occur discover at a later stage. However following are some of the symptoms that are witnessed by the patients. * Pain in the abdomen is the one that is closely related to the liver cancer and is usually a sign of large tumor that has spread deeper in the liver. * Unexplained weight loss is also a strong symptom. * Unexplained fever is also among vital symptoms. * On physical grounds, an enlarged and tender liver is commonly found. * Liver cancer is composed of many vessels, it is vascular. As a result increased amount of blood reaches in hepatic artery and result in turbulent flow in the artery which appears as loud voices audible with a stethoscope. However the symptoms can very from patient to patient. And all the above mentioned symptoms are not bound to only liver cancer as they can also be observed in other diseases as well. The treatment of liver cancer, just like other cancers, depends on a number of factors. * And condition of the patient. Keeping in mind these factors the physician can suggest whether surgery, chemotherapy or radiation treatment will be suitable. In specific cases a mixture of two of the treatments is used to cure the patient.